The Wartusker is an ancient vessel, from the days prior to the First Unhuman Wars. It is an Ogre Mammoth, a warship from a bygone era. Before the Elves crushed the combined fleets of the humanoid races, the Wartusker raided ports across the Radiant Triangle. When the First Unhuman Wars began, the Wartusker put up a descent fight for years, destroying three Archaic Man-O-Wars in two separate engagements before it disappeared. It was spotted briefly during the waning days of the Unhuman Wars, sporting heavy damage and apparently abandoned. It was investigated by a party of elves, who reported it looked like the crew had turned on one another and critically damaged the hull. Satisfied, the elves departed and the Wartusker disappeared into history. The Wartusker has recently reappeared at the fringes of the Known Spheres, fully repaired and manned by a crew of ogres, orcs, and half-orcs. It is supposed that the Wartusker is allied with the scro. It has made opportunistic raids on isolated villages on Krynn, Oerth, Toril, Greela, and Ginsel. It has not yet been spotted in other spheres, but seems to appear in a sphere, make several raids over the course of several weeks, and then disappears for months at a time. The Wartusker is a fairly standard Ogre Mammoth. Some of the interior spaces have been modified but its weaponry is unchanged. The ship’s hull is made of oak, which has been stained dark brown. The elephant-like face is painted bright red, with white, ivory tusks. There are several bags, boxes, and other small containers throughout the Wartusker. When one of these containers is searched, roll a percentile dice and compare the results to the table below. The Wartusker has six heavy ballistae and two heavy catapults. Normally this area is watched over by nine orcs and 1-2 orogs. During battle, the weapons will be fully manned by orcs and each ballista will be commanded by an orog. The ogres will wait below for boarding action to begin. The Upper Deck is dominated by a large day room where common ogres typically hang out. The vast area has numerous stools and small tables where ogres play dice, eat meals, torment slaves, and take naps. At any given time, there will be twelve ogres in this central area, along with 2-12 orcs and 1-4 slaves. The large central area is lit by two dim lanterns. Two ogres are stationed here. They act as lookouts and guards. The room has a navigation table that folds up, a locked chest with navigation equipment, and a locked chest with a dozen star charts and a score of charts for various areas of planets. The chests are both locked (Chotaka has the key) and Wizard Locked, cast by a 9th level wu jen (Chotaka). These lockers each contain four barrels of ballistae bolts (about 20 bolts each) and six crates of catapult shot (about 10 heavy stones each). The ammunition is in fairly good shape for creatures such as ogres. In addition to the ammunition, there are four crates in each locker with parts to repair the large weapons on the Top Deck. Strong ladders lead to the weapon pits. They are heavy and strong enough to support the weight of a very large ogre. Due to their construction, they are awkward for smaller creatures to use; medium-sized creatures take one full round to climb the ladders, while small-sized creatures take a full two rounds to do the same. The main deck holds the bridge and quarters for the crew. 4. Crew Quarters (First Shift). This room has thirty ogre-sized berths, stacked two high. Males and females share this room, which leads to a great deal of fraternization. There is about forty large sea chests scattered across the room, each holding various personal effects of the crew (roll 1d4 times on the container contents table per sea chest). This room reeks of ogre. 5. Crew Quarters (Second Shift). This room is a mirror image of area 4 above. The main difference is that this room is quarters for the sixty orcs that make up the bulk of the crew. As such, the many berths, furniture, and hammocks are sized for orcs instead of ogres. There are eighty sacks and ten sea chests throughout the room (roll once per sack or chest for contents). Four large tables, twenty-odd chairs, and four benches are found here. This room is used by the ogres for gambling, dining, and relaxing between shifts. Orcs are often here as well, but risk being subjected to bullying and rampant hazing, so many avoid the area. Strewn about the room are nine bags, carelessly tossed into corners or under tables and forgotten. The door to the bridge is Wizard Locked, cast by a 9th level wu jen (Chotaka). Only Chotaka and other ogre magi aboard know the passphrase. Olarf has been told the passphrase, but can never remember it, so he pretends he never needs to enter the bridge. This suits Chotaka just fine. The bridge is fairly Spartan, with the Type III Minor Helm at the center of the room. Star charts of Realmspace and Krynnspace hang from the walls. There is a voice tube to the top deck. Chief Olarf and his family reside in this chamber. There is a large bed for Olarf and his wife (they rarely sleep together), and another for Olarf’s son Meatsack. There are three large trunks around the room stuffed with ogre-sized clothes; one trunk has a false bottom, hiding a sack with 500 gp. Another chest holds the family treasure of 4,000 gp in various coins, 1,200 gp worth in cheap jewelry, and 4 art objects worth 500 gp each. Under a bed is the remains of a human female, who died a month ago at the tender ‘care’ of Meatsack; the body was stashed and promptly forgotten. Locked in a wardrobe is a young human female, Lladria, who is stripped naked, very battered, and very pregnant. Lladria has been Olarf’s plaything for the past few months, and will soon deliver his next half-ogre child. She has been horribly abused by the ogres and as a result is very sullen, withdrawn, and has been rendered a mute due to her treatment. She has no combat abilities. The door to this room is Wizard Locked, cast by a 9th level wu jen. Only Chotaka knows the pass phrased. In stark contrast to Olarf’s smelly, messy quarters, Chotaka’s quarters are Spartan, clean, and surprisingly serine. A simple straw mat is Chotaka’s bed. Furnishings include three trunks, a large sea chest, a wardrobe, a large desk with a chair, and a large bonze tree. On the walls are watercolor paintings of storms, seas, and monsters; there are four paintings in all, and they are worth 400 gp, 600 gp, 900 gp, and 1,100 gp. The three trunks unlocked and not trapped, with two dozen spellbooks between them. These were taken from enemy spellcasters (most of 6th level or less), containing many common spells and 2-8 uncommon to rare spells (GM’s choice on what these spells are). The highest level spell in any of these spellbooks is 4th. Chotaka intends to hand these over to his superiors so that the ogres can understand what spells are common in the Known Spheres and how to best counter them. The sea chest is locked (Chotaka has the key), Wizard Locked, and trapped with a hand-chopping blade that strikes for 4d4 points of damage to someone directly in front of the chest (normal chances to disarm). Inside are three Potions of Ogre Control, three Potions of Healing, one Potion of Rainbow Hues, one Potion of Ventriloquism, one Necklace of Strangulation, and one Scroll of Protection from Gas. The wardrobe contains many fine silk clothes sized for a large ogre mage, but no treasure. The ship’s six orogs share this room. It has six hammocks, a table, six sea chests, and nine bags. The sea chests just contain smelly clothing. A table, bolted to the deck, has playing cards (marked) scattered across the top of it, along with 5 sp worth of wages. Roll the contents of the bags randomly. b. Ship’s Doctor Shitai no Kama’s Quarters. The door to this room is locked; Shitai has the key. Inside, the room has a straw sleeping mat, a wardrobe, a chest, and a shrine to the Dark Empress. The room is otherwise clean and Spartan. The wardrobe contains nothing but clothes. The chest holds Shitai’s personal effects from Steelspace. The shrine is guarded by a Glyph of Warding. Any creature who is not an ogre mage who violates the Shrine will be struck by an electrical burst that inflicts 1d4+8 damage; the Glyph can discharge once per round, and can be discharged up to ten times before becoming exhausted. Juvenile ogres and half-ogres are bunked in this room. There is a dozen hammocks, about six sea chests (stuffed with ill-fitted and tacky clothing), and four bags (contents determined randomly). There are many toys on the floor, ranging from lead army figures to miniature spelljammers. The largest and most elaborate is a toy Ogre Mammoth, and two (broken) elven Man-O-Wars. The door to this room is Wizard Locked, cast by a 5th level Wu Jen. Both Shito Hasbia and Tetsu no Choa know the pass phrase (Shito cast the spell). Inside, the room is fairly Spartan, with two straw sleeping mats, two wardrobes, two sea chests, and a silk screen to block off one corner. The wardrobes hold nothing but clothes for the two Wu Jen. The chests are Wizard Locked and contain the Wu Jens’ spellbooks and private caches of cash (about 500 gp worth in coins, jewelry, and art objects). A pair of heavy-set oaken doors protects the jettison alcove from wildspace. During battle, the doors are thrust open when the jettison is ready to be fired. Otherwise, they are kept closed to protect the crew while they reload the weapon. There are bins around the room with enough debris to fire the jettison a total of twenty times. The doors can be barred from the inside to prevent intruders from using the doors as an entry point. Typically there will be four bored orcs on-duty; during battle, eight will be here to man the weapons and doors. 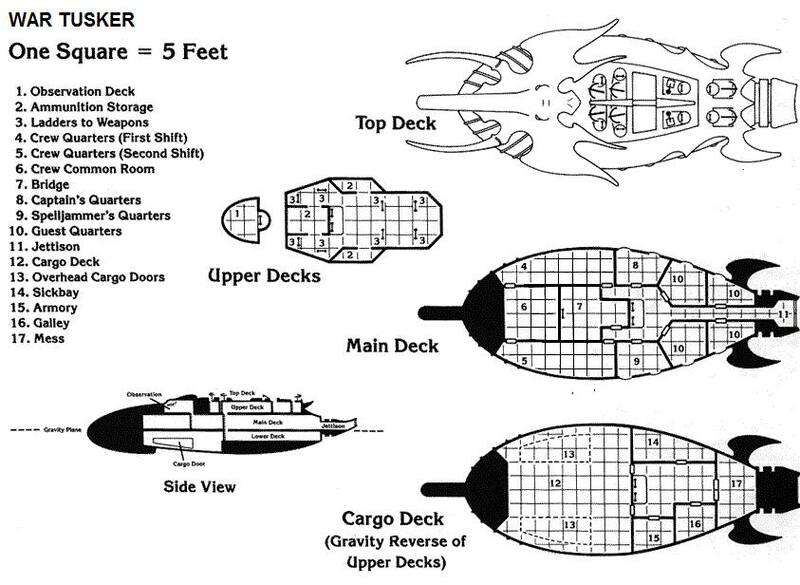 The lower deck is primarily devoted the ship’s cargo hold, galley, and mess. On this deck, a torture chamber and armory can be found as well. There are always crewmen darting about on this deck, from orcs and ogres looking for a meal to the officers torturing a new prisoner to extract information. All of the loot taken by the Wartusker is crammed into this hold. Currently, it is three quarters full, so the ship will rendezvous with an Ogre Mastodon in a nearby sphere to transfer cargo. The cargo is piled up in what appears to be a haphazard fashion, but a trained eye will spot that the cargo is securely lashed down and surprisingly well-balanced so as to not shift during maneuver. There are many items of note within the hold. There are 420 small kegs of beer, each worth 5 gp. Piled along wall are 75 bolts of printed silk from Shou Lung, worth 120 gp each. There is a pair of fully assembled medium ballistae and a medium catapult, taken from an elven Man-O-War. Nine crates of weapons (long swords, battle axes, pole arms, and the like), with 50 gp worth of weapons per crate. 300 burlap sacks of flour and 150 sacks of rice are piled up, worth 3 gp per bag. One crate holds small bags of spaces, total value of 1,300 gp. Buried under the junk is six locked (but not trapped) chests with 5,000 gp, 18,500 sp, 7,300 gp, 800 pp, and 24,900 sp, respectively. There are also 18 art objects, each worth 100-800 gp. In the back, behind the pile of flour and rice sacks, hidden behind a permanent illusionary wall, is a door knob in the side of the hull. This is a Hold of Holding, which opens an extra-dimensional space large enough to hold an additional twenty tons of cargo. Inside this space is 800 barrels stacked carefully and lashed down. If the barrels are opened, they will be revealed to contain a mass of woody, pulpy material. Each of these is a human or demi-human, preserved by a softwood spell. They were kidnapped from small villages around the Dales, Shou Lung, and the crews of spelljammers. Soon after capture, they are stuffed into the barrels, a softwood spell is cast upon them, and then the barrel is sealed, air-tight. The captives are perfectly preserved until they reach their destination, the slave-markets of Steelspace. The cargo doors are counter-weighted so that they can be opened by a single ogre pulling on a chain. Near the cargo doors, there is a goblin blade ready for launch. Inside the Blade is a chest containing a scroll with these spells: Invisibility, 10’ radius, Create Air, and Create Minor Helm. There is also a spare set of spellbooks for Chotaka and his ogre magi, as well as a sack with 2,500 pp. This will be used as an escape craft by the ogre magi if disaster strikes the Wartusker. If at all possible, they will remove the Hold of Holding from its hiding spot and take it with them, along with whatever loot they can secure while fleeing. This grisly chamber is not a place of healing, but instead a torture chamber. There is a large stone slab in the middle of the chamber where creatures from halfling-sized up to ogre-size can be chained down. There is an iron maiden in the far corner. From the ceiling hang innumerable chains, some with sharp hooks to impale and hang prisoners. Many instruments of torture hang from the walls. An elf, a crewman from the Man-O-War Harpstar, is trapped in the iron maiden. He is a 2nd level fighter (hp 3; 14 if fully healed). He is a simple sailor and cannot offer reward for his rescue, but can offer his services for one year. The remains of two of his fellow crewmen hang from hooks, obviously horribly tortured before they died. The door to this chamber has a lock, but it is rarely set (the ogres are quite careless). Inside there are weapon racks, barrels, and crates that contain 20 large battle-axes, 20 boarding pikes, 12 heavy crossbows, 360 heavy crossbow bolts, 40 spears, 30 longswords, 15 short swords, and 40 enormous spears (2d12 damage in the hands of an ogre). Several suits of armor are stuffed into large barrels as well: 35 suits of studded leather sized for man-sized creatures, 20 suits of leather armor, 16 suits of chain armor sized for elves, and 2 suits of plate armor (in pieces, sized for a dwarf and one for a human). Additionally, there is enough ammunition to fire each of the heavy ballistae a further 20 times. In the mix of weapons, there is a longsword +2, a suit of elven chain +1, the sword Magibite (longsword +1/+2 vs. magic-using and enchanted creatures), and a spear +1 that glows with a soft blue light when brought within 5’ of gemstones. The ship’s galley has a large cauldron hanging from the ceiling set over a brick oven. There is also a large butcher block table, complete with an enormous meat cleaver in the side, and pots, pans, skillets, knives, and dozens of other kitchen utensils. Giant hooks hang from the ceiling, upon which are impaled four humans and elves (victims of the Wartusker’s last raid), being prepared for butchering. During the day, Madame Babu is found here with three other female ogres, busily preparing meals for the ogre crew. The Wartusker’s mess hall has two long tables and eight benches. The room is quite disgusting, with a floor covered with the remnants of half-eaten meals and picked over by more than a dozen giant rats. The rats are so fat and happy that they have become quite docile. They will not attack until molested. Three times daily, the crew gathers for a feast; otherwise the room is deserted. Nice ship! And very useful info! My party seized one and refitted it for medium sized humanoids adding one more deck. This will help detailing it…Thank you! For the sake of discussion, I would like to ask what would be intended purpose for this vessel? The detailing, equipment of the ship and would implicate that this is long voyage ship but the crew number and composition is too numerous and suggest it is assault/raid vessel with a close operational base. I’m seeing some problems which would compromise the Wartusker’s missions and purpose (intel). Air (until fouled), food and water supplies on this ship would be sufficient for around 2 months due to crew composition and number. That would significantly increase ships signature on spying missions and decrease operational range. Halving the number of the crew (would fix this. Having high level (14/16+) spellcaster aboard is another option to fix the problem. Or an artifact. Adam Miller is one of the game writers for Hackjammer, so I assume the “Minor Helm Type III” is from that game system (sorry, I should have marked that system in the categories and will remedy that). The canon material says that ogres are tribal and travel in family groups; new ogres must come from somewhere. As to the air thing; yes, I agree with you in that this is often a problem on the ships of ogres and goblinoids who, being typically unable to meet elves spell to spell, and being unable to outmaneuver them as a general rule, gear their ships to marine boarding actions. Hence, they tend to be overcrewed. And while I agree that high level spellcasters and artifacts will solve the problem; they are hardly easy to come by. But I am sure it won’t matter that much in this case; there are several ogre magi on the ship, and I am certain that one of them must have *gust of wind* in a spellbook, even if he typically does not keep it memorized. Also, perhaps this ship was designed to travel in a sphere that has several planetary bodies but they have few resources (mostly asteroids and the like). Still you raise some very good points and I will see if I can convince Adam to come and engage with you in discussion about it here! Air – to be honest, air is the least worry for any ship. Even a 1st level wizard can fix any air problem with a simple wall of fog/obscurement spell. So between the wu-jen and priests, I wouldn’t consider air an issue. Cast any sort of ‘fog’ spell once a month an you’re good. Helms – Straight from Hackjammer. See, in HJ, I modified the helm system. Tonnage moved has been broken away from the ‘major/minor’ denotation of helm. Instead, you have Helm Type 1-6 (in a fashion very similar to good ole 1e magic items); Type 1 can move 25 tons; Type 2 – 50 tons; Type 3 – 100 tons; Type 4 – 125 tons; Type 5 – 150 tons; Type 6 – 200 tons. Major/minor simply denotes level conversion (major 2/1; minor 3/1). In this way, you could have a minor helm that can move a larger ship than a major helm, just slower. Note that Helms of Type 4 and above are EXCEEDINGLY rare, and even types 1-3 are pretty rare as well. Most ships get by on Splendid Sails or Ornery Oars (which cannot make planetfall). Thanks Adam! It’s good to have a “how Hackjammer helms work” reference handy for those who do not have the book. Perhaps all will become clearer once the book is published. If you’re speaking of Hackjammer, it *is* published! You can get it at http://www.amazon.com/HackJammer-Hackmaster-Adam-Miller/dp/B000IV52YA.